I've always had a thing for adventure games. Even during my adolescent years of being a gamer, I'd have settled for a good adventure title over something that offered big guns being shot by a woman with very large breasts any day. The first adventure game that really blew me away was Broken Sword: The Shadow of the Templars. Boasting great voice acting, characters, music, puzzles and an epic storyline, it had it all. However, aside from the brilliance of Broken Sword, another adventure game I enjoyed comes to mind right now, naturally. That game was Sherlock Holmes: The Case of the Silver Earring by Frogwares, a game on PC that I sunk many hours into back in 2004. While it wasn't perfect it did satisfy my need for adventure, and though I haven't played one of Frogwares' Sherlock Holmes titles since, their latest Holmes offering is finally upon us. But as someone who craves decent adventure games, does this satisfy my urge for smart gameplay and complex puzzles? Read on as the game is a-foot! Developed by Frogwares and out now for Xbox 360, Xbox One, Playstation 3, Playstation 4 and PC comes Sherlock Holmes: Crimes and Punishments, a game that, despite some flaws, is an adventure well worth taking. This is the seventh entry in Frogwares' Sherlock Holmes series, and though he may have gotten a slight facelift in recent years -perhaps to make him appeal to younger gamers- this entry falls pretty much in line with what I played back in 2004. Set in 19th Century London, Crimes and Punishments doesn't just focus on one case, but instead allowing the player to solve 6 separate cases. Each one is vastly different as to what came before it, and in the role of Sherlock Holmes himself it's up to you to use your vast intellect to bring the guilty to justice. However, what's interesting about Crimes and Punishments is that each case has 3-5 different solutions, with around 10 alternate potential endings to finish off a case. This means that the game doesn't exactly lead you directly to the right solution, but rather merely puts the right tools in your hands to do so. This freedom of choice is both compelling and extremely satisfying. Despite the game offering a choice between both a third and first-person perspective, Crimes and Punishments should only be played in first-person. The series, and the entire genre itself, has always been focused on a first-person perspective, and here it just works the best. Plus, the third-person perspective in this game is bloody awful. Sherlock Holmes' mind works pretty differently compared to your average person, and while that must be difficult to convey visually, here I believe Frogwares have nailed it. Coming across like a hybrid between Robert Downey Jr's and Benedict Cumberbatch's recent interpretations of Arthur Conan Doyle's character, his muddled frantic thoughts appear on screen, he can zoom in on and intensely profile an individual, he can instantly focus in on details at a crime scene, while also having a knack for coaxing the truth out of witnesses and potential suspects. 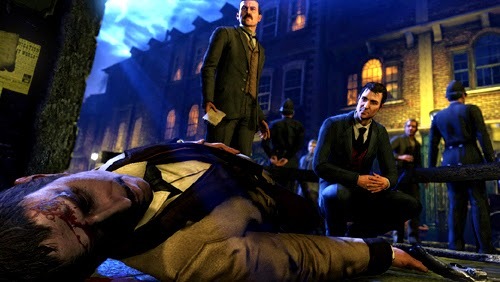 All of these skills are at hand in the game, as while most of the gameplay relies on seeking out clues, walking around locations and interviewing various characters, the true joy of Crimes and Punishments comes about when you can finally start piecing those clues together. At the end of a case the game goes inside Sherlock's mind, and represents the various clues and suspects as lit up brain synapses. It's here that you'll need to come to your conclusion, a conclusion where you either need to absolve or condemn a suspect. But as I said before, there's more than one outcome for each case, and if you haven't paid enough attention during the case at hand, it's quite likely that you'll fail, ultimately arresting the wrong suspect. Visually it's impressive, if a slightly dated by this point. Environments are highly atmospheric and detailed, and you'll find yourself pulled into the world and its inhabitants. Whether your investigating and a dark, street-lit bloody murder scene on the streets of London, or merely taking a moment away to admire a beautiful, still like to the backdrop of the setting sun, Crimes and Punishments delivers both in terms of gameplay and visuals. Though it may be a bit too streamlined compared to some of the classic adventures games that I have enjoyed in the past, Crimes and Punishments is a highly impressive entry from Fragwares, and one that doesn't fall alongside other previous "casualised" game series. If you're looking for adventure, intrigue and a game that doesn't treat you like an idiot, Sherlock Holmes: Crimes and Punishments is the one for you. Sherlock Holmes: Crimes and Punishments does justice to Sherlock Holmes and gets a 4/5.